Howdy folks! 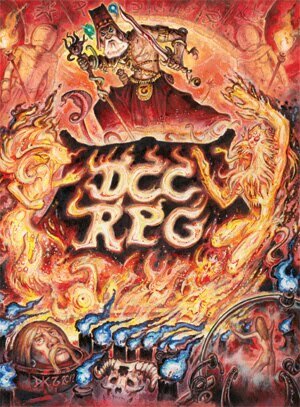 I “restarted” my online campaign of DCC RPG just a week ago and it has been everything that I wanted in a tabletop RPG these days… small to zero preparation, light (but amazingly entertaining) rules, a lot of space for players to wreak havoc and great modules. 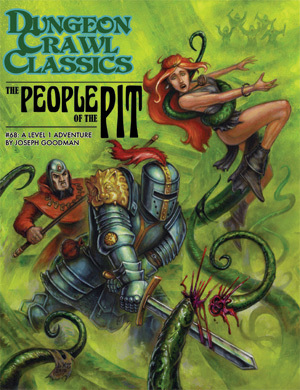 We started the ‘People of the Pit’ module with the “lawful” side of the original party that (almost one year ago) survived the ‘Sailors on the Starless Sea’ adventure (the “chaotic/villainous” part of the group went in another direction during the last year to face the ‘Doom of the Savage Kings’ adventure and it was a blast!). So, after our first session of ‘People of the Pit’, the party retreated to the nearest towns to equip themselves, hire new cannon-fodder and to upgrade those 0-level PCs that survived the Funnel (we got 2 new players for this part of the game). One of these 0-level poor souls was an almost unplayable PC – a human Cutpurse with four negative Ability Score modifiers and his best stat is a 12. His players decide to call him Fatso, the Fat – a Samwell Tarly-like character. To our great surprise, Fatso was an amazing character during the session (and to boost the best rolled 0-level PC of that players was summarily killed). In other words, DCC RPG Funnel turned what would be an unplayable PC in the game session most memorable character! Discombobulation: This open-ended ability allows the Fool to (1 per round) gains a free (non-attack) action using a d14 action dice (d16 at 6th level, d20 at 7th level and d24 at 8th level). This ability is triggered when the Alice/Fool miss an attack roll. Luck: Fools can spend Luck to reduce any damage they suffer. I’m still not sure if those abilities make the Fool too powerful in DCC RPG. Let’s see. (Yes, this blog is still alive... sort of.) My local group of players had a really bad experience with Warhammer Fantasy Roleplay – a mix of wrong expectations and irrational preferences in my opinion. They find Warhammer Fantasy too absurd in its “Grim-Dark-Humour” style of fantasy. They also can’t accept how the setting is presented in the boardgames and videogames versus its presentation in the tabletop RPGs. Another day, after hearing they complaining of Warhammer Fantasy and it’s “Mohawk dwarves” for about an hour I said that the problem was that they’re playing the wrong game: they wanted a game of dark fantasy, of higher level and using classical themes (no British humor or Heavy Metal influence I guess… but yes do please add more Tolkien). If such game was rooted in their favorite RPG (d20 system) so much the better. In other words, they wanted to play Midnight. But that affirmation brought up an entire different issue. You see, my players love to death games like Pathfinder, D&D, Star Wars Saga etc., but they complain every time I try to bring a dungeon-based or more “Old School” proposal to the table. They say they want drama-laden and character-driven campaigns, where they can develop their characters with agency and (cliché) grand backgrounds (where most PCs are almost always candidates to lone wolves and you start to wander why in the Nine Hells they are playing a tabletop cooperative game). In other words, they’re hypocrites. 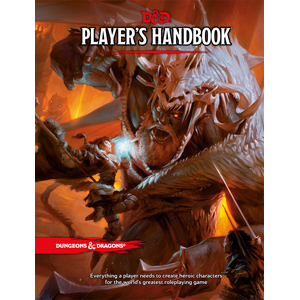 But that’s normal… most of my groups pretend to play only Storyteller or Drama System games, but relish combat and tactic encounter-based games (mostly d20 System). It’s a conundrum I guess. 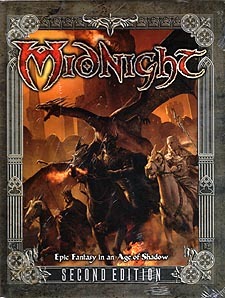 What I’m trying to say is that they really wanted to play Midnight, but when a told them that the setting is as much (or more) lethal than Dark Sun, they started complaining again (yes, they’re a basically bunch of 25 year old teens). So, I discovered that I had to run a dark fantasy game where Evil is everywhere and characters are deep and complex, facing dire challenges but not dying easily (like a TV series). At first I just thought of adding Hero Point rules to Midnight (either from Arcana Unearthed or Pathfinder) to avoid random deaths. I was already using D&D 3.5 because Midnight 2nd is such a lovely game that I really didn’t wanted to have to convert everything to other system. But I also thought that just adding Hero Points was lazy, so I needed a more robust mechanic. 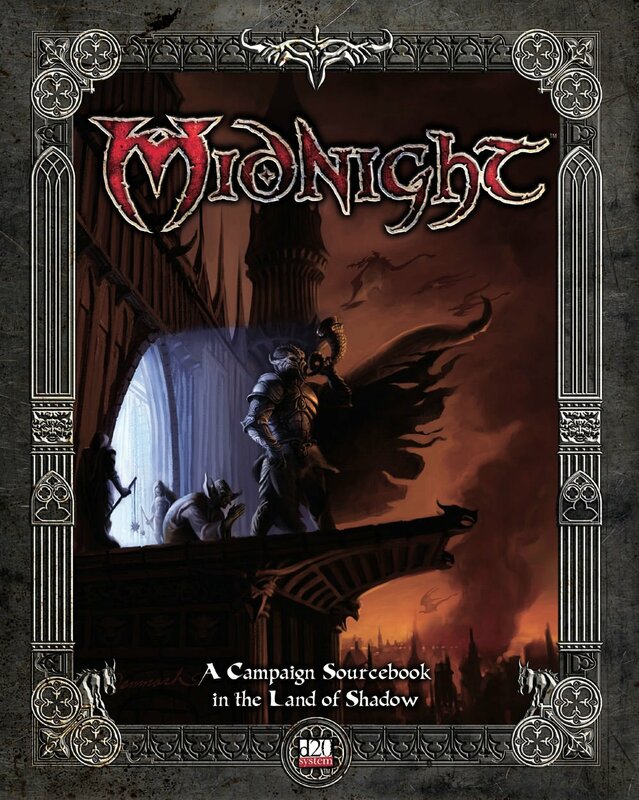 The theme of our Midnight campaign is ‘Hope & Shadow’ (because some eldritch rule dictates that you must add ‘Shadow’ to anything related to Midnight J) and it deals with corruption and the will to bring hope to place where it’s forsaken (you can see it as a variant of Tolkien’s Long Defeat theme). The game is about the last survivors of a hidden village (the PCs) hunting down the orcs that killed or slaved their loved ones. The motivation of the PCs is their emotional link to those NPCs. Thus I created a mechanic around two metagame pools – Hope Points and Shadow Points. Hope Points are used basically the “recharge” a PC. They reset a character – maximum hit points; restored daily abilities; remove ability damage, drain and curses; recover spell points etc. (to balance the fact that spellcasters get a greater boost, I made Hope Points grant a Warrior/Rogue pool that can be used as temporary bonus to certain actions). PCs only gain Hope Points from interacting with special NPCs called Hearts. Shadow Points are basically your “Dark Side Points” and pack quite a punch. You can use 1 Shadow Point to obtain “maximum effect” for 1 entire round – i.e. you’re considered to roll the best number in all dices and to succeed in every action (if deemed possible). Like an overpowered “Take 20”. Or you can use Shadow Points to change the way the rules work (like the Arcana Unearthed’s Hero Points). Shadow Points were made to be tempting and awesome. PCs gain Shadow Points by destroying their relationship with their Hearts and by succumbing to the Shadow (i.e. Izrador, the Dark God of Midnight). There’s a limit to how much Shadow Points you can gain before being corrupted to Shadow (the limit is a bit random, so players can’t guess it and abuse it… I’m testing 1d4+4 Shadow Points rolled secretly). There’re other uses to both Hope and Shadow Points but I won’t get in the minutiae. The campaign must still run like a d20 traditional game, so I needed lots of encounters dealing with survival, combat, exploration and such (besides classical Midnight stuff like evading orc patrols, facing Legates, finding nexus etc.). But I also needed to have character-driven and background-heavy scenes. So I structured the game around a flashback/present frame. Each session a random player gets a flashback. In this flashback the PC interacts with one of his 2 Hearts – a Heart is a NPCs chosen from that PC’s past (defined during character creation). Each flashback is a short scene dealing with a difficult moral choice or emotional conflict. If the PC manages to uplift and give hope to their respective Heart, they come out of the scene with 1 Hope Point. These flashback scenes are pure roleplaying experiences 90% of the time (in Drama System you’d call them ‘dramatic scenes’). If the PC manages to purposely hurt their relationship with their Heart, they can gain 1 Shadow Point. The tactical element of that frame lies in the fact that a flashback can be invoked anytime during the game session. So a PC can choose in the middle of a combat to summon a flashback in order to gain 1 Hope/Shadow point and thus win (or doom) the day. Besides the rolled flashback for a random player (which each player can only get once, then the cycle starts over again), each PC can also invoke 1 flashback per character level. The final limitation on flashback scenes is that only 2 such scenes can happen per game session (otherwise the session becomes practically a solo game and the pacing is ruined). Besides their 2 NPC Hearts, each PC must choose another PC to be their third Heart. This last Heart works a bit differently. Each player decides a type of relation between his PC and the other (love, brotherhood, apprenticeship or even envy or more complex things like “the desire to push the PC to his limits and show his potential”***). Basically, you have a responsibility to keep your 3rd Heart going on, you have to instigate hope in him. If you can keep him for 1-2 game sessions without suffering harmful conditions (like Dying, Confused, Panicked etc.) or suffering curses, insanities (and other effects) you grant him 1 Hope Point. However, if you can’t do it for 2-3 sessions, then YOU gain 1 Shadow Point. The idea is to keep pressuring the party. You either gives Hope or fall to Shadow. Fighting Izrador is hard for the spirit and I tried to reflect that (and the possibility of falling like the Night Kings did) mechanically… We’re still in an our 4th session the campaign has been an enriching experience for me in regard to game designing. ***The party’s channeler PC created this option for his 3rd Heart.